Charles Koch, chosing Tobasco over Sriracha at the Koch Industries cafeteria. As the nation warily watches every Republican presidential candidate kiss the ring of billionaire donor Charles Koch for a shot at his network's $300,000,000 pool of presidential cash, Charles Koch did something unusual. Last week's USA Today interview with Charles Koch noted his shifting opinion on what he calls climate change "hysteria:"
For the record, Koch says this of climate change: "You can plausibly say that CO2 has contributed" to the planet's warming, but he sees "no evidence" to support "this theory that it's going to be catastrophic." Wait...Charles Koch just accepted that the planet is warming? Hold your applause. Clearly, Mr. Koch still denies that there's a problem - which means he's missing the entire point of discussing climate change. But any movement from Charles on the 5 Stages of Climate Denial--from #1 down to #3--is a big deal. This is the same guy who has poured $80 million into organizations that have misrepresented climate change science to the public and advocated against any viable solutions to the problem. Koch's Right-Hand-Man: "Charles is ahead of me on this." For context, you should probably know that Fink told the room's billionaires that the minimum wage would lead to fascism, comparing today's low-income Americans to pre-Nazi Germany citizenry. Not exactly a room full of academics. And since one of the people that Mr. Fink 'meets with' was a scientist that he funded to study global temperature data, you have to wonder how much experience Rich Fink has with willful ignorance. Charles Koch cannot deny is that he's seen the global temperature record data. In 2011, through the Charles Koch Foundation (CKF), CKF president Richard Fink funded a high-profile study on global surface temperature data. This dataset, which was an unnecessarily redundant reproduction of several other similar studies, was constructed by a scientist who at the time was a climate change denier. 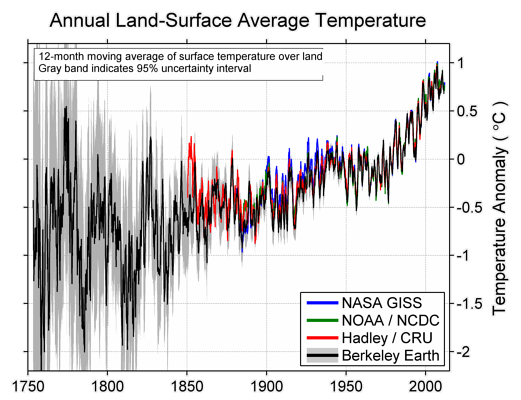 BEST data compared with previous reconstructions of global surface temperature data. Dr. Richard Muller's Berkeley Earth Surface Temperature Study (BEST) made headlines when he announced his acceptance of what climate scientists had already been saying for over 15 years--yes, people are responsible for unnatural climate variability that scientists have documented--and surprised the country by becoming an advocate for solutions to global warming. This put Mr. Koch in an awkward spot. Koch's $150,000 grant to Dr. Muller made him the project's top single donor, and Muller was a celebrated skeptic before his dramatic change-of-heart. Add to that Mr. Koch's background in science--a chemical engineering degree at the Massachusetts Institute of Technology. For such an educated, celebrated albeit controversial high-society businessman, the refusal to acknowledge science that is understood by middle schoolers guaranteed to undermine the sensible reputation that Koch Industries has spent a lot of money to put out there. But Charles gets no credit here. Dumping almost $80 million into organizations that have attacked the scientists who study climate change and interfered with virtually every proposed policy and regulation to solve global warming isn't being a science-savy CEO. It's being a denier, and especially in the context of a self-serving petrochemical billionaire, that's pretty offensive to the rest of us. We define climate change denial as "anyone who is obstructing, delaying or trying to derail policy steps that are in line with the scientific consensus that says we need to take rapid steps to decarbonize the economy." Mr. Koch remains a staunch denier in that regard. The Koch brothers continue to finance campaigns to make Americans doubt the seriousness of global warming, increasingly hiding money through nonprofits like DonorsTrust and Donors Capital Fund. Why focus on Charles Koch and David Koch? Many large foundations associated with corporate fortunes are active in financing climate denial groups - Anschutz, Bradley, Coors, DeVos, Dunn, Howard, Pope, Scaife, Searle, and Seid, to name a few. Unlike Koch, most of those fortunes did not come from owning a corporation like Koch Industries, historically rooted in fossil fuel operations. And none come as close as the Kochs in terms of decades-long focus on actively building a political influence network and coordinating other wealthy executives, corporations and families to dump amounts money into politics that not even the Koch brothers could afford. Check out Greenpeace.org for more research on the Koch brothers crusade against climate science. Last week, the Center for Media and Democracy and ProgressNow released a series of reports on how the State Policy Network coordinates an agenda carried out by affiliate "Stink Tanks" in all 50 states. Responding to questions from reporters, SPN's CEO Tracie Sharp demanded that each of the seemingly independent groups were "fiercely independent." Sharp also acknowledged privately to the members that the organization’s often anonymous donors frequently shape the agenda. “The grants are driven by donor intent,” she told the gathered think-tank heads. She added that, often, “the donors have a very specific idea of what they want to happen.” She said that the donors also sometimes determined in which states their money would be spent. Tracie Sharp responded to the New Yorker with a generic statement that didn't address her contradictory statements. And who knows if there's anything useful she could say at this point, The State Policy Network was just caught with its pants down. For those who don't spend their days reading about the inner workings of the corporate-conservative political machine, the State Policy Network isn't a familiar name. But it's an important entity. SPN serves as the umbrella of ALEC (American Legislative Exchange Council) and all of its state and national allies pushing a coordinated corporate-friendly agenda through all 50 states. SPN and ALEC have led the coordinated attack on clean energy in states like North Carolina, Kansas and now Ohio. Dozens of SPN groups are longtime players in the Koch-funded climate change denial movement. By orchestrating against policies to lessen global warming impacts or by directly undermining the science, SPN's efforts have ranged from urging inaction on global climate treaties and forcing teachers to misrepresent climate science to their students. Beyond shilling for the coal, oil, gas and nuclear companies bankrolling ALEC and SPN's operations, these coordinated entities attack public employee unions, wages and pensions, block Medicaid expansion, suppress legitimate voters, push to defund and privatize schools, and undermine choice in women's health. And who pays for SPN's work in all 50 states? SPN's main purpose is to advance the interests of its corporate funders: dirty coal and petrochemical industries, the tobacco giants, agribusiness, pharmaceutical companies, private education firms, tech and telecom companies, and the usual web of trade associations, law firms and lobby shops paid to represent each of those industries. Corporations use SPN to advance political campaigns they are typically embarrassed to associate with publicly. The State Policy Network also serves to advance an ideological agenda that tends to undermine the interests of most Americans in favor of those who are particularly wealthy and well-connected. The Koch brothers fit this description, of course. But they're joined by a legion of lesser known multi-millionaires and billionaires, sometimes coordinating directly with the Kochs. These SPN funders include Richard Mellon Scaife, Phil Anschutz, Art Pope, the Coors family, the DeVos family, the Searle family, and the remains of the Bradley family fortune, to name a few of the better known of these sources of dark money. Few citizens recognize the names of this quiet minority of political puppetmasters, but people still feel the bruise of plutocratic spending as state and national politics are pushed to new extremes. More on the State Policy Network can be read in the National Stink Tanks report. SourceWatch has the full list of SPN members and affiliates and SPN funders.